Several trees were blown down causing scattered power outages Wednesday evening. DURHAM (WTVD) -- Several trees were blown down causing numerous power outages Wednesday evening. At one point, more than 5,300 Duke Energy customers were without power in Wake and Johnston County alone. Several trees were blown down at Fort Bragg near Pope Army Air Field as well. 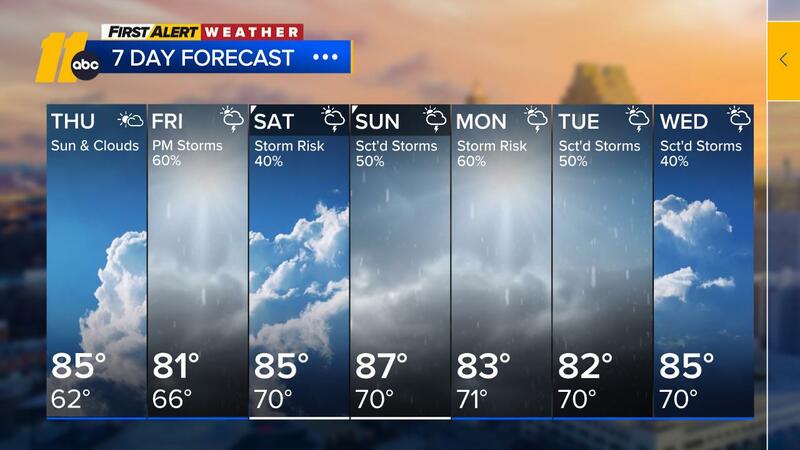 "High pressure will strengthen over the region Thursday and Friday, and that means hotter temperatures and little chance of rain," said ABC Chief Meteorologist Chris Hohmann. "Highs Thursday will hit the mid and upper 90s with heat index values at or above 100." The high will weaken a bit over the weekend, so temperatures will come down ever so slightly, and rain chances go up, but just a bit.